Claude Koeberle is quite a fascinating study and has been called a “force of nature.” He is opinionated (“Many of California’s fruit-forward wines do not pair well with food”), devoted to Pinot Noir with religious fervor (“Cabernet Sauvignon is an evil weed”), and talkative. He could impress you with his culinary accomplishments (Apprenticed under Paul Bocuse and Alain Chapel, became the youngest 3 Star Michelin Chef in Paris, Chef at Ma Maison and L’Orangerie in Los Angeles, James Beard Award as a master chef, French Laundry partner, and one of the driving forces behind Creative Culinary Concepts, Inc., and K World Cuisine, Inc.), but he would rather talk at length about how he has taken old world (Burgundian) beliefs and applied them to produce wines with finesse and balance that work in harmony with fine cuisine. 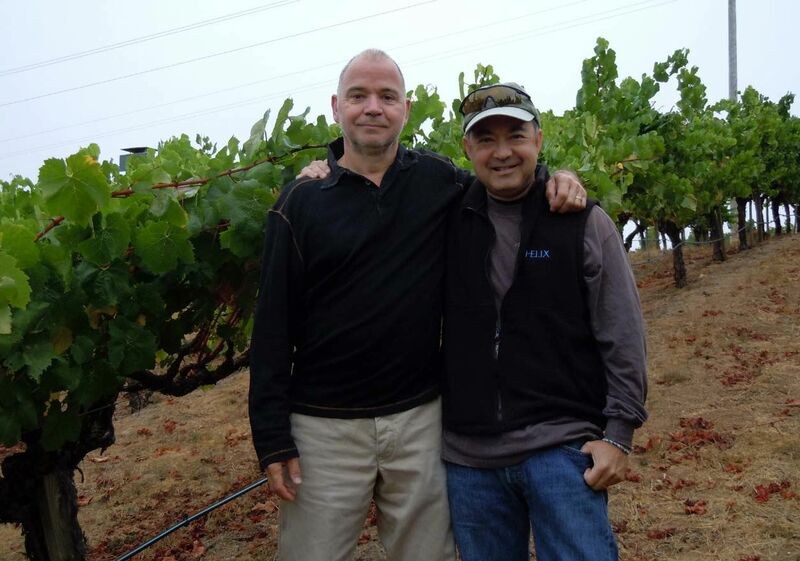 Together with long time friend and partner, Donald Plumley (photo right), and their respective spouses (Elisabeth and Beth), Claude started Soliste in 2005 with the release of a Sonatera Vineyard Pinot Noir. The name Soliste is derived from the special barrel or “soliste” that Burgundian winemakers reserve for their family and friends. The winemaker is Ryan Zepaltas (Zepaltas Wines and Siduri Wines). A vineyard property in the Sonoma Coast is being negotiated for acquisition, and a new Soliste winery to be built on the property is in the planning stages. Claude has released four MonoClone® Pinot Noirs from select Sonoma Coast vineyards in the 2010 vintage. He is a believer in Single Vineyard, Single Clone and Single Cooperage wines - what he calls MonoClone® and since 2009, all Pinot Noir releases have reflected this. A single clone, married with a specific site, climate and exposure, and then aged individually in a single cooperage. I had the opportunity to sample all four wines at lunch with Claude recently and came away impressed by his "single minded" devotion to producing “Beaune in the USA.” The wines include L’Ambroisie (clone 828), L‘Esperance (clone 115), Nouveau Mode (Pommard clone) and Forêt (clone 23). Two of the wines I tasted in depth at home are reviewed below. A Sauvignon Blanc and Chardonnay are also offered. The Soliste team manages its vineyards 100% regardless whether they own or lease them. Soliste wines are produced in very small quantities and are allocated through a mailing list. They are also available from fine dining partners. Visit the website at www.soliste.com. 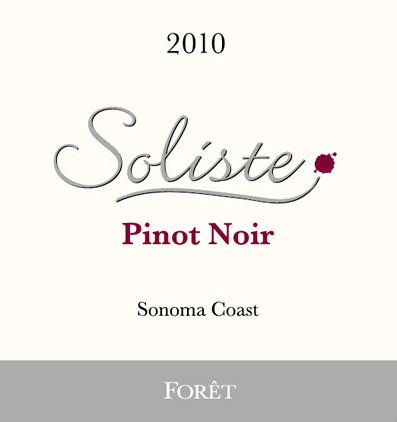 Soliste was recently one of the featured wineries at In Pursuit of Balance. Why buy these wines? How many Pinot Noir producers in California were born in Burgundy, are accomplished chefs, and are offering food-friendly wines that reflect a Burgundian sensibility? 14.1% alc., 149 cases, $85. Clone 23 (Mariafeld). Mariafeld clone came to the US from the government agriculture research station in Wädenswil, Switzerland in 1966. Infrequently bottled as a stand-alone clone. From Guidicci Vineyard in Occidental. · Medium reddish-purple color in the glass. Very clean, bright and fresh aromas of black cherries and potpourri. The wine delivers a delicious mouthful of dark berry and black cherry fruit, expanding on the palate with nuance and class, and finishes with a statement. A subtle cola and earthy accent add interest. Juicy, with soft tannins. When tasted a day after opening and re-corked the, wine was still pumping out Pinot goodness. 12.8% alc., 23 cases, $100 (sold out). Clone 828 from Guidicci Vineyard in Occidental. Tasted a day after opening from a re-corked bottle. · Moderate reddish-purple color in the glass. Red fruits are featured in the nose and on the palate. An acid-driven wine that is more austere than the Soliste Forêt with less ripe fruit flavors including red cherry and cranberry, finishing with a cleansing riff of citrus. A very pretty, elegant wine with gossamer tannins. If the Forêt is akin to a leather jacket, this wine is more like a silk shirt. Very good.